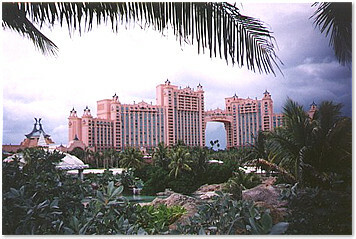 Just before guests reach Atlantis-Paradise Island, it becomes clear that this isn’t just any ordinary resort. 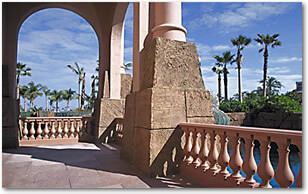 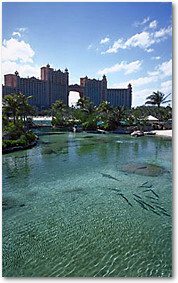 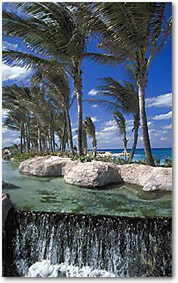 As they cross the new tree-lined bridge from Nassau, Bahamas, the resort comes into full view. 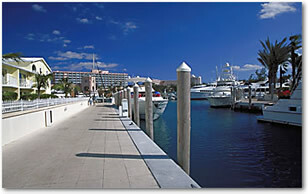 The Royal Towers, connected by a Bridge Suite, the Coral Towers, and the Beach Towers, rise impressively above a new marina filled with massive yachts. 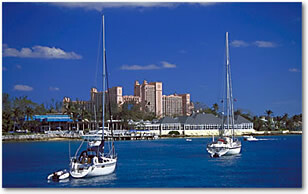 Near the marina, are the pastel colored Harborside villas, which provide accomodations seperate from the main towers. 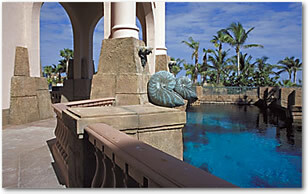 A huge dome next to the towers is capped by two large swordfish sculptures. 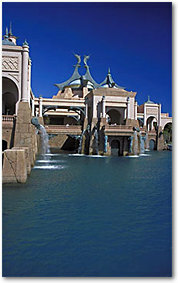 The roadway, running thru a tunnel underneath the marina, leads to the resort’s oversize entrance, guarded by seven gold-winged horses and surrounded by cascading fountains. 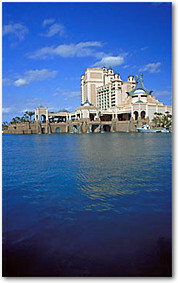 Two huge bronze doors lead to the main lobby, called the Great Hall of Waters. 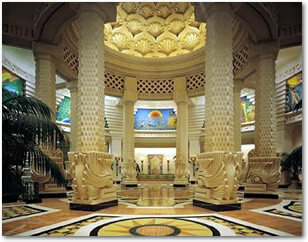 Supporting the lobby dome are eight marble columns Inside, there is water, water everywhere, bubbling from geysers at tiny pools and, in the main lobby, cascading in waterfalls from four massive pillars supporting the domed 70-foot ceiling.